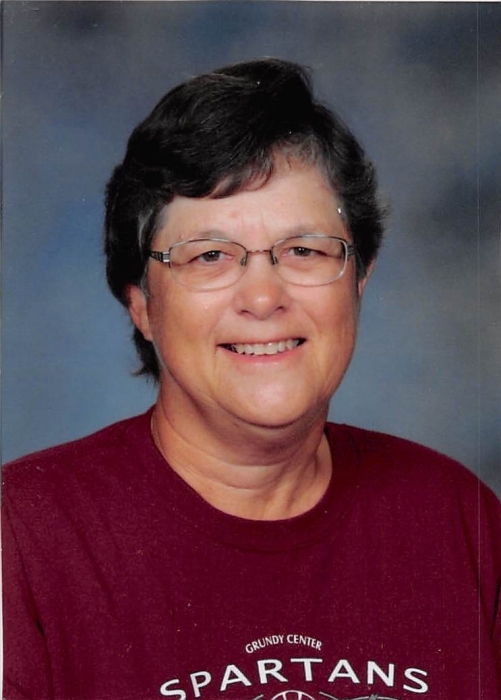 Rhonda Groninga, 64, of Wellsburg, Iowa, passed away on Friday, February 8, 2019 at the Grundy County Memorial Hospital. Visitation will be held on Tuesday, February 12, 2019 from 4:00 p.m. until 7:00 p.m. at the First Christian Reformed Church in Rural Wellsburg. A funeral service will be held on Wednesday, February 13, 2019 at 10:30 a.m. at the church. Burial will follow at the church cemetery. Memorials may be directed to the family. Rhonda was born on March 13, 1954 in Eldora, Iowa to her parents Claus and Frances (Nederhoff) Primus. She was raised in Wellsburg and graduated from Wellsburg High School in the class 1972. She was united in marriage to her husband Randy Groninga, on July 18, 1973 at the First Christian Reformed Church. Together they made their home in Wellsburg and welcomed their daughter Natalie into their family on January 4, 1976. Rhonda was known for her love for kids by coaching, bus driving, attending Iowa State Cyclone games with her family, watching Mya’s activities and watching her grow. Rhonda is survived by her husband Randy; daughter Natalie (Chris) Osore; granddaughter Mya; brother Rollin (Bern) Primus; many nieces and nephews and mother-in-law Gwendolyn Groninga. She was preceded in death by her parents and father-in-law Virgil Groninga.